TOKYO, Nov 2, 2018 - (ACN Newswire) - "Think Global, Think Hong Kong", a large-scale Hong Kong business promotion organised by the Hong Kong Trade Development Council (HKTDC), concluded yesterday (1 Nov) in Tokyo. The mega promotion, comprising a business symposium, business-matching sessions, networking events and a gala dinner, attracted more than 2,900 participants keen on exploring Hong Kong-Japan collaboration opportunities. The full-day symposium featured over 70 high-profile speakers from Hong Kong, the Chinese mainland and Japan, who shared their insights and business intelligence on a series of topics, from how Japanese companies can expand to new markets using Hong Kong as a platform to opportunities in different sectors including finance, technology, legal services and the creative industries. More than 380 business-matching meetings were arranged to connect Hong Kong businesses and services providers with Japanese companies. The HKTDC also led several business missions from Hong Kong to Japan, comprising more than 220 delegates, to discuss cooperation in the areas of finance and investment, the design and creative industries, technology, professional services and the food industry. 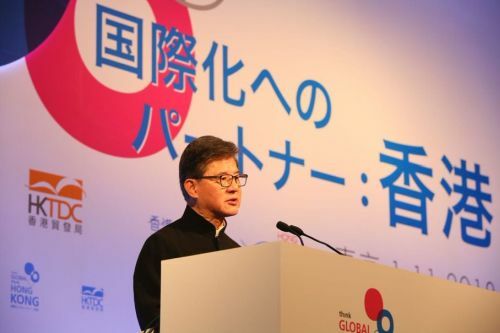 At the opening session, Carrie Lam, Chief Executive of the Hong Kong Special Administrative Region (HKSAR), delivered the opening remarks as a highlight of her first official visit to Japan in her current capacity. Guest of honour Yoshihiro Seki, State Minister of Economy, Trade and Industry of Japan shared his insights on cooperation between Japan and Hong Kong in the areas of trade and business. 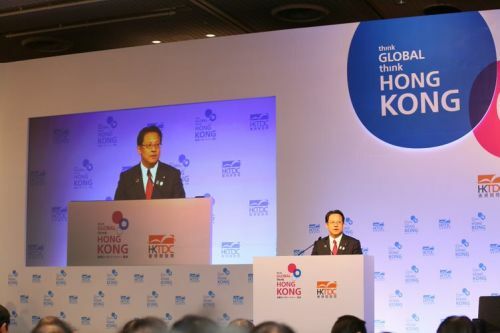 In his welcome remarks, Vincent HS Lo, Chairman of the HKTDC, said: "Under the Belt and Road Initiative, a new engine of growth for the global economy, opportunities for cooperation between Hong Kong and Japan are perhaps more promising than they have ever been before. The recently announced development of the Guangdong-Hong Kong-Macao Greater Bay Area is another initiative that will further enhance Hong Kong's competitiveness and advantages as an international business and financing hub." 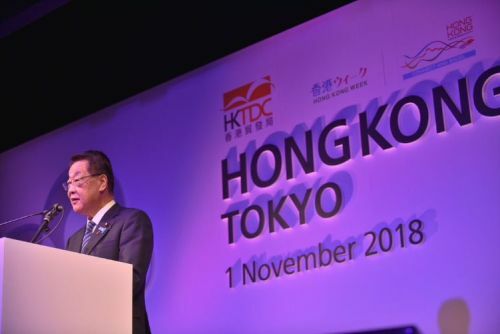 Following the opening ceremony, the HKTDC and the Japan External Trade Organization (JETRO) signed a renewed memorandum of understanding (MoU) and agreed to explore potential collaboration in new sectors such as start-ups, innovation and technology, two-way investment, third-country infrastructure opportunities, human resources development, and the cultural and content industries. In the same morning, the HKTDC also signed a MoU with Tottori Prefecture. The two parties agreed to strengthen their collaboration in business matching and the utilisation of HKTDC's platform to enhance the export of prefectural products. Leveraging Hong Kong advantages to "go global"
During the morning symposium, renowned business leaders from Hong Kong, including Laura Cha, Chairman of Hong Kong Exchanges and Clearing Limited; Oscar Chow, Non-Executive Director of Chevalier International Holdings Limited and Managing Director of Polaris Holdings Limited; Victor Chu, Chairman of the First Eastern Investment Group; and Fu Yuning, Chairman of China Resources (Holdings) Limited, shared their viewpoints on the economic outlook, risks and opportunities in Asia, examining how Japanese businesses can capitalise on growth opportunities using Hong Kong as a catalyst. Prominent Japanese business leaders, including Koki Ando, President and Chief Executive Officer of Nissin Foods Holdings Co. Ltd; Akihiko Kumagai, Senior Executive Vice President of NEC Corporation; and Kanetsugu Mike, President and Chief Executive Officer of MUFG Bank Ltd, shared their experience of successfully leveraging Hong Kong's service excellence and international business network to expand their presence into Asia and the rest of world. In the afternoon, a thematic session entitled Expanding Business to China and ASEAN, with Invest Hong Kong (InvestHK) being the special sponsor, offered insights on how Japanese companies can make use of the Hong Kong platform to expand their business. Speakers included Stephen Phillips, Director-General of Investment Promotion, InvestHK; Takaya Awata, President of TORIDOLL Holdings Corporation; Hiroyasu Koma, President and Chief Executive Officer of GLM; Kei Suzuki, Director and General Manager, Asia & Oceania Division of Ryohin Keikaku, Co. Ltd (MUJI); Tommy Li, Creative Director of Tommy Li Design Workshop Limited; and Takahiko Yasuhara, Managing Executive Officer and Head of East Asia of Mizuho Financial Group, Inc. and Mizuho Bank, Ltd.
Six other sector-specific sessions were organised to cover a broad range of topics including finance and investment (co-organised with the Hong Kong Monetary Authority), design and liveability (co-organised with the Hong Kong Design Centre and sponsored by Create Hong Kong), smart finance and smart living (co-organised with Cyberport), legal risk management (co-organised with the Department of Justice of the HKSAR), and healthy ageing and the smart city (co-organised with the Hong Kong Science and Technology Parks Corporation). A mini-exhibition featuring Hong Kong start-ups, named InnoVenture Salon, was set up at the symposium to showcase the innovative business ideas and entrepreneurship of some 20 fledgling companies, including those from Cyberport, Hong Kong Science and Technology Parks (HKSTP) and the HKTDC's "Start-up Express" programme. The Hong Kong Private Equity and Venture Capital Association joined Cyberport and HKSTP to offer an onsite mentoring service in a bid to attract more Japanese start-ups to set up operations in Hong Kong. After a busy day of business discussions, a high-level gala dinner was held at Happo-en, attended by more than 400 government officials and business leaders from Japan and Hong Kong. 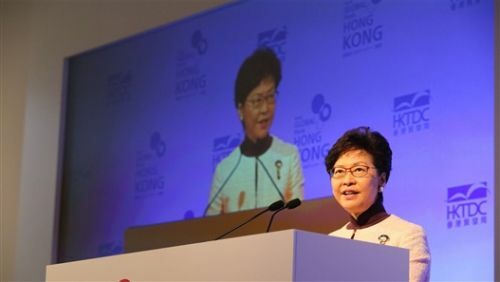 HKSAR Chief Executive Carrie Lam and Takamori Yoshikawa, Minister of Agriculture, Forestry and Fisheries of Japan, were guests of honour at the event. Hong Kong Michelin-starred chef Albert Au presented a special menu cooked with Japanese delicacies supported by Japan's Ministry of Agriculture, Forestry and Fisheries. The gala dinner also featured music performances by the Asian Youth Orchestra, Hong Kong singer Charmaine Fong and a cappella group SENZA, together with a showcase of contemporary cheongsam creations from 10 Hong Kong's leading fashion designers. "Think Global, Think Hong Kong", supported by more than 130 organisations in Hong Kong and Japan, is the key business promotion event of Hong Kong Week in Tokyo, which continues until 11 Nov.